As we begin the final dance after months of pseudo-campaigning, one of the biggest questions both political leaders will be posing in this election is, 'Whom do you trust?' It's an important question in more ways than one. Today's editorial from the Daily Telegraph makes it clear that they believe only one party is worth your trust. 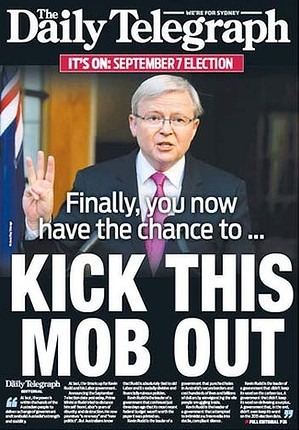 While it's common for newspapers to make a stand for one party or the other come election time, it's rare that it happens on the first day of the campaign, even if the Telegraph's editorial is hardly surprising for a newspaper that had Labor in its crosshairs well before Kevin Rudd took office. One of the things we expect from our media is that they will ask the hard questions on an election trail. Additionally, trustworthiness in reporting is one of the few advantages that our mainstream media outlets can claim over the blogosphere. While the Telegraph's editors might claim they will still place the Coalition's policies under the same level of scrutiny as Labor's, by taking such a strong editorial stand they have at the very least undermined this claim. There are also questions being raised as to how much all of the News Limited publications are being influenced by Murdoch's fear of the NBN's impact on his businesses — a commercial interest that few Australians will share. While Eureka Street could never claim to be without bias in its coverage of issues, its agenda is driven by a concern for social justice and the impact of policies on the poorest and most vulnerable. This means it must hold all parties up to scrutiny. There are serious questions that need to be asked of both major parties, and their leaders, over the next few weeks. And with many disaffected Labor supporters considering voting for the Greens in this election, there are many hard questions that need to be asked of them, too. If the mainstream media can no longer be trusted to ask the serious questions of both parties, perhaps it's time for the game to move elsewhere. Understanding this, Rudd has brought in social media strategists who worked on the Obama campaign in the United States to advise Labor. Social media has become a powerful tool for politicians, offering unmediated access to constituents and bypassing newspapers and television bulletins entirely. As a venue for political discussion Twitter is far from perfect. We're yet to see it used to really force a politician to account for their policies. But it does have the potential to be a game-changer for political campaigning. Previously, access to politicians was only given to those in the party faithful who attended the events, and the media members privileged enough to be allowed to accompany politicians on the trail. On social media, everyone can participate in the process. Whether it's conducted on social media, sites like Eureka Street, or in mainstream media, the terms of this contest shouldn't be set by organisations with an admitted preference for one party over another, but by individuals or organisations whose concerns are for the greater good of Australian society. If our mainstream media outlets have given up that aspect of their mission, then other individuals and media outlets need to step into the gap. Both parties will try to make this a personality-based campaign, calculating that their leader's attributes (or the other leader's failures) will swing the difference. If this election is allowed to become a slanging match between parties, then the Telegraph will continue to sell its newspapers, but they will be the only winners. The only way the Australian people can win in this election is if it becomes a real discussion about the kind of country we want to live in. For that conversation to happen, we need a media we can trust. Michael McVeigh is editor of Australian Catholics and Province Express. He is also senior editor at Jesuit Communications which publishes Eureka Street, Madonna, and Finding God's Traces. He is standing in for Michael Mullins for the next two weeks. Would Michael McVeigh please list the serious questions that should be put to both parties. If the name of the game is trust, then we are done for as it is a long time since we dared to trust either the media or the politicians. I have resigned myself to voting for the party of least harm, the one I dislike the least. Sad, but we have to reign in our expectations in this climate of spin from all sides. Thanks for the question, Barry. I didn't want to retread what Andy Hamilton and Ray Cassin wrote in their articles today, so I didn't go into much detail on that topic. But from a social justice perspective, I think both Labor and the Coalition need to be challenged on the values that they believe Australia should uphold, and whether policies such as their treatment of asylum seekers align with those values. I think Labor needs to be challenged on how its big ticket policies in education and welfare will be paid for without further cuts to welfare for the most vulnerable. I think the Coalition needs to convince us that it won't cut back advances such as the NDIS, and to give us a vision for how it's going to sustain the environment of the country so it'll still be a liveable place in 20 or 50 years time. While the Greens need to be challenged on whether they can provide workable, economically sound policies that align with the principles they espouse. That's a start, anyway. Happy for others to chime in. Mainstream media certainly needs to adhere to some basic standards. We can't expect "new media" to fill the void as it is yet to reach maturity and, generally speaking, is more of a platform for barracking and bagging than considered reporting. For me, the word that stands out in any request that the serious questions to be put to both parties is the word "both". I assume the term "both" refers to the Greens on the one hand, and the LibLab Party on the other. ABC Radio News’ Political Bias Samples were taken 5 August 2013. ABC Federal Election News contained mention of the Greens and Green program ONCE in ten broadcasts that all mentioned the two main parties. This mention was citing a Greens leader saying that if you wanted to save the Tarkine, the possum (or was it the potaroo?) and the Barrier Reef you would vote Greens. And that was all the News said about their platform! Nothing about their economic, social, political or other conservation policies! I have tried to contact the ABC about this, with no luck. Newspapers will not publish this either. Good material - fairly fair - in Oz Cath. Bishops' recent statement about the 'Common Good'. anticipating election. Don't often say this, but 'go boys'! From a former 'handmaiden' in said mob. Thank you very much for giving us an election coverage we can trust. I have to keep turning off the television due to the biased reporting on ABC anddon't watch the commercial stations of a morning because of all the ads and other inane info. Newspapers are no help either so I will be just reading your info. Please tell me how to vote this time around. I don't know whether or not we can trust the Coalition. They haven't been trusted We all know we can't trust the ALP after the BIG lie "There'l be no carbon gtax under a government I lead". Worth Remembering. Murdoch Snr in WW1 did his best to "get rid of General Monash"..Now his US son does his best to "get rid of this mob".another Oz target.???. At least the commercial Telegraph is up front with its opinion. As opposed to the taxpayer-funded ABC with its farcical protestations of impartiality, regularly exposed at election time when the comperes enthusiastically proclaim a "win for the ABC...er,... ALP". People who purchase the Daily Telegraph or the Australian know what they are doing. They will not purchase the Sydney Morning Herald or the Age. They do not agree with ABC Radio and other left wing organizations.You see Michael McVeigh many people are sick of the vitriolic and hatred bias gainst Tony Abbott and the Liberal Party. Never mind the hard questions and trust, just show me a Leader, a true Leader, a person that can actually lead and we are prepared to follow.